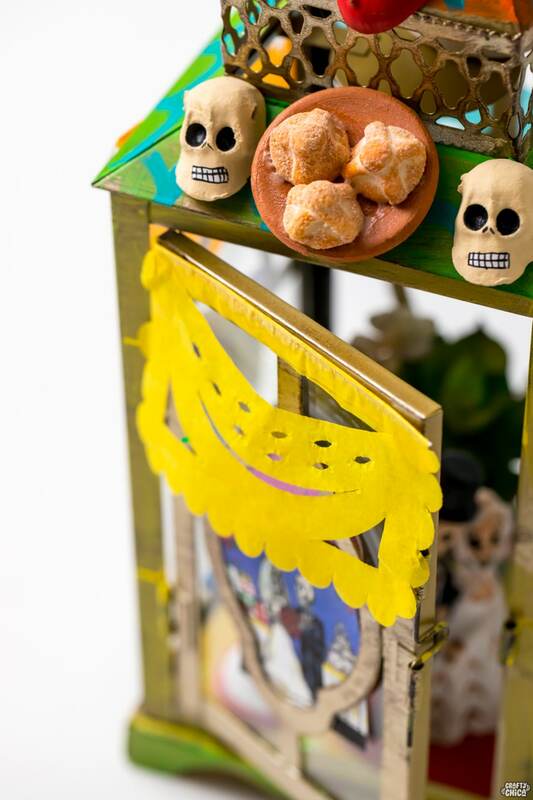 Need a Dia de los Muertos shrine idea? I have a good one! 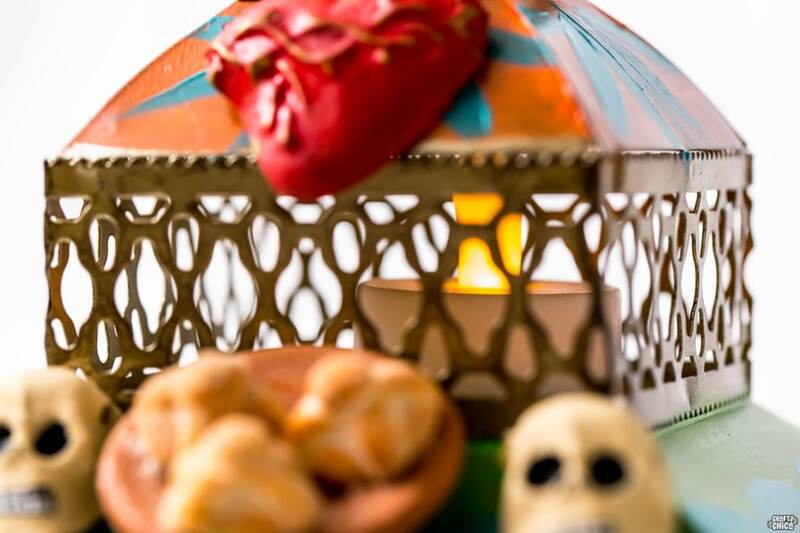 I love this time of year because all I can think about is celebrating Dia de los Muertos – and making shrines and ofrendas to honor loved ones who have passed away. 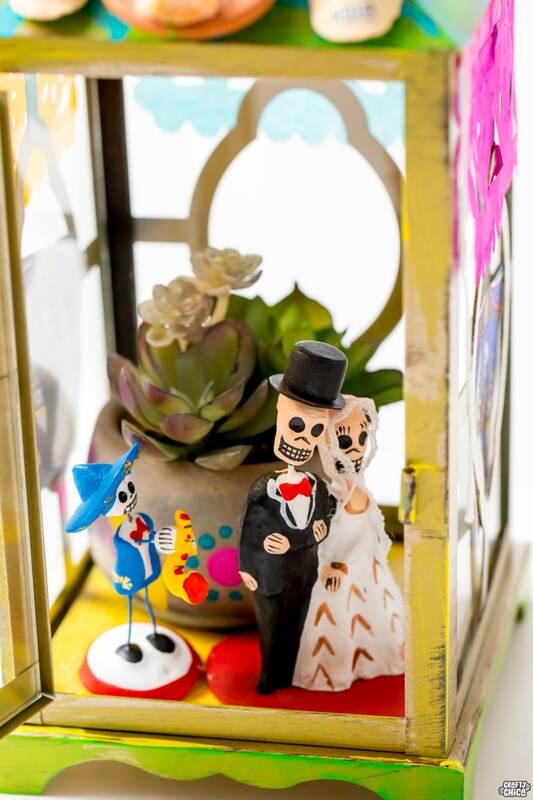 While we have an ofrenda in our house, I also like to make smaller ones to place as decorations. 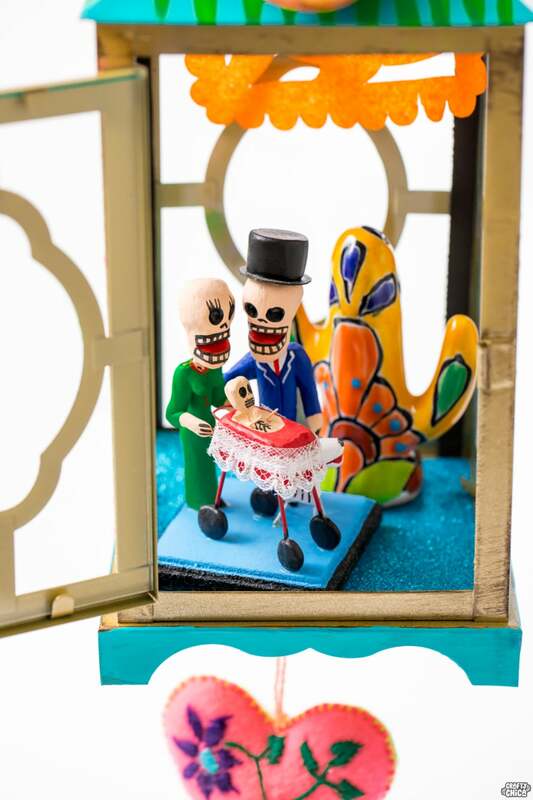 I recently came across some lanterns and thought they would be perfect to house little muertos scenes! Here is a video tutorial I made with the help of Grateful.co and Thanksgiving.com! 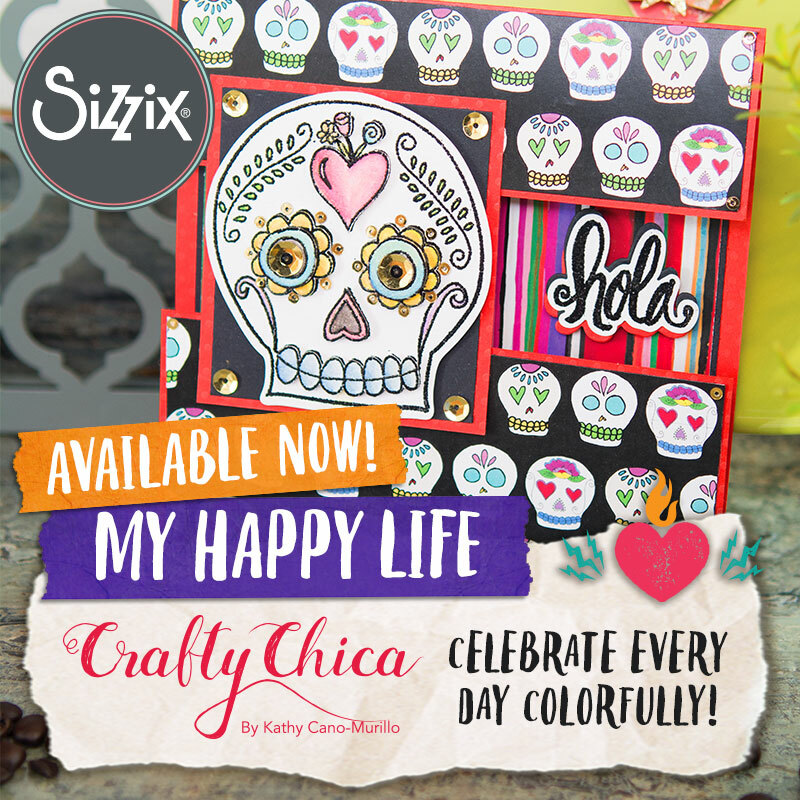 RELATED: 100+ More Day of the Dead ideas! 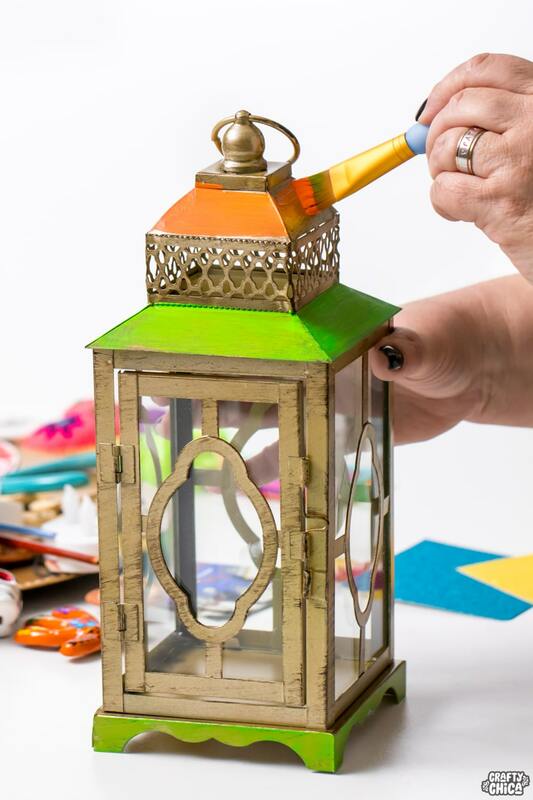 Paint the outside of the lantern and let dry. Drill two holes in the bottom of the lantern. Tie a piece of thin wire to the lantern. Cut the glittered cardstock to fit inside the lantern. Use the dry adhesive to secure it inside. 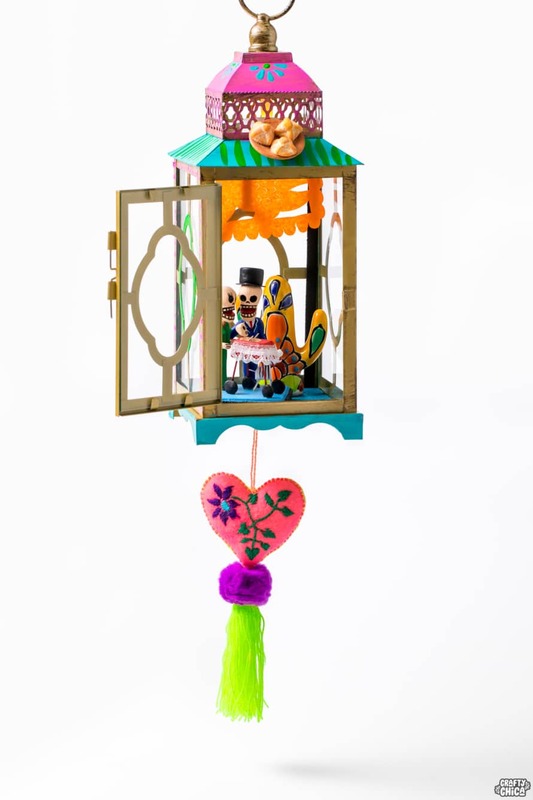 Hang an ornament from the wire from the bottom of the lantern. 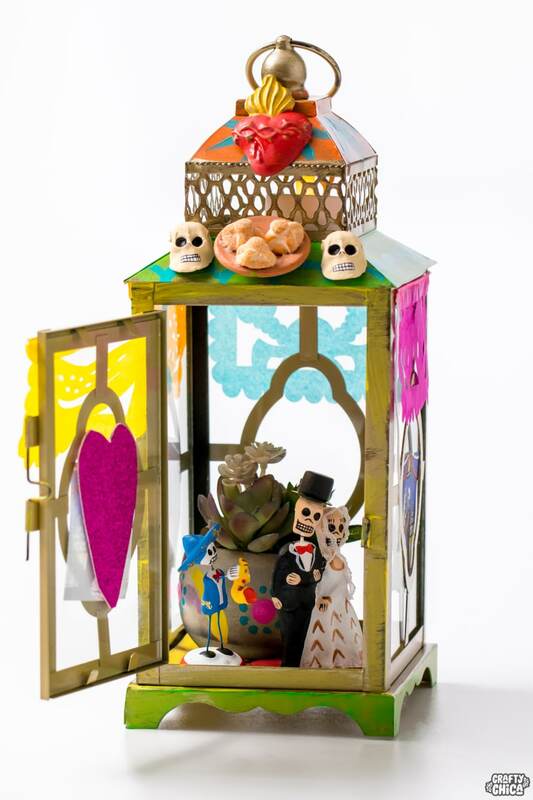 Insert the battery-operated tealight inside the lantern. 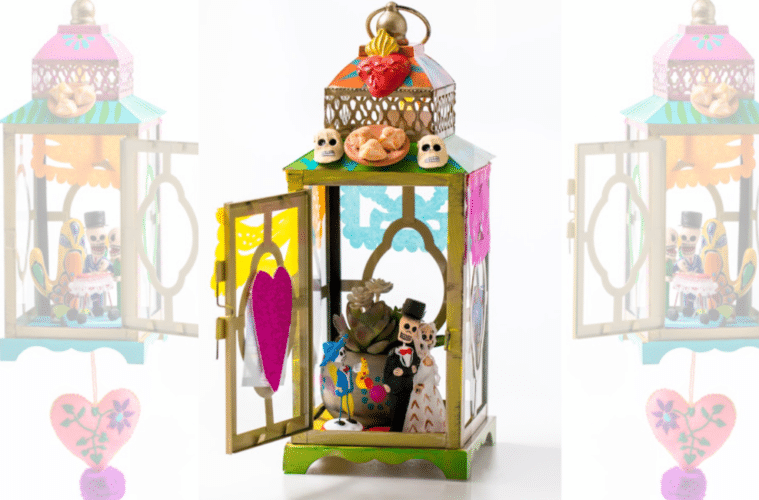 Use Day of the Dead trinkets and figurines to make a little shrine inside a lantern! 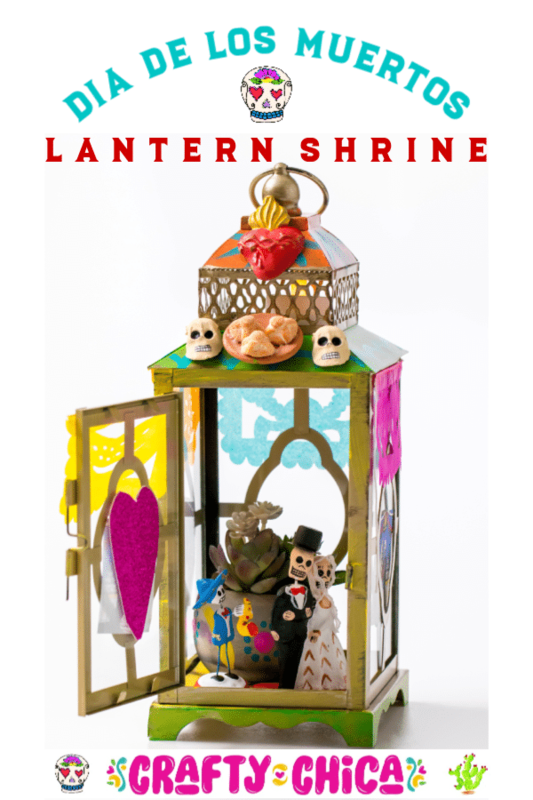 Decorate the top of your lantern shrine with small decorations! 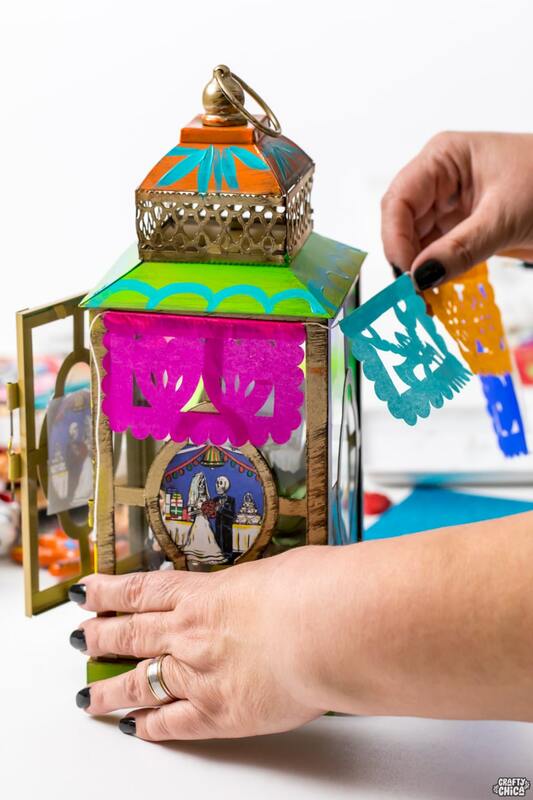 Use mini papel picado to line the outside of your lantern shrine! Before starting to decorate, drill two holes at the bottom so you can thread through a string to hang an ornament! 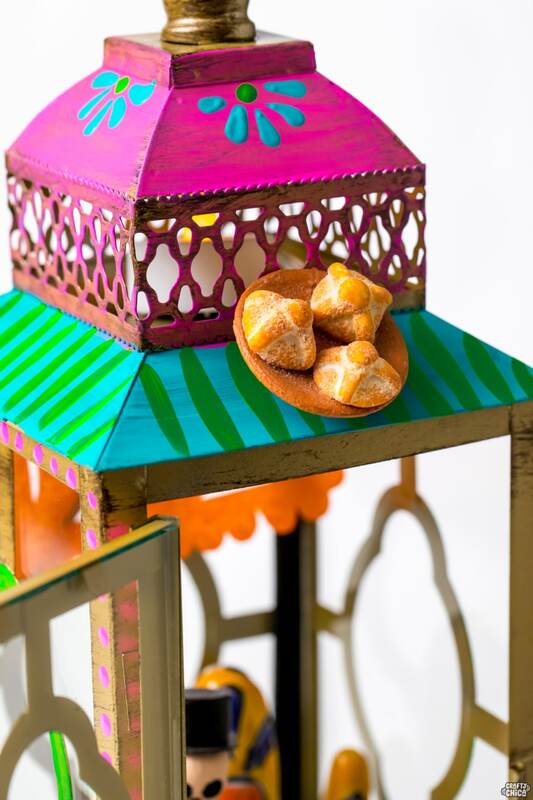 Line the bottom of your shrine with glittered cardstock and then glue down small objects and figurines! You can even add in personal photos! 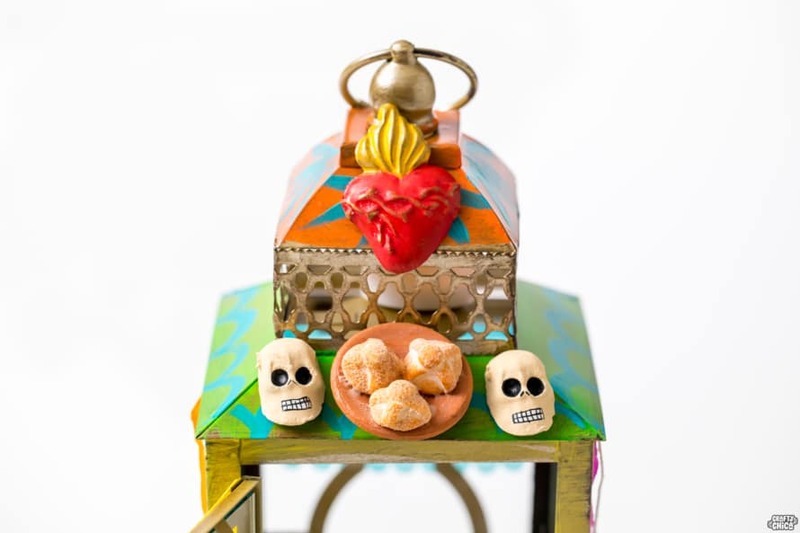 You can look for Mexican imports and use some small pan de muerto magnets to add to the top of your lantern shrine! Thank you so much to the team at Thanksgiving.com and Grateful.co for filming and photographing my project for me, didn’t they do such a beautiful job? Make sure to follow them for lots of great ideas and recipes. And look for more content like this coming up! Previous ArticleTrunk or Treat Idea: Graveyard Scene! 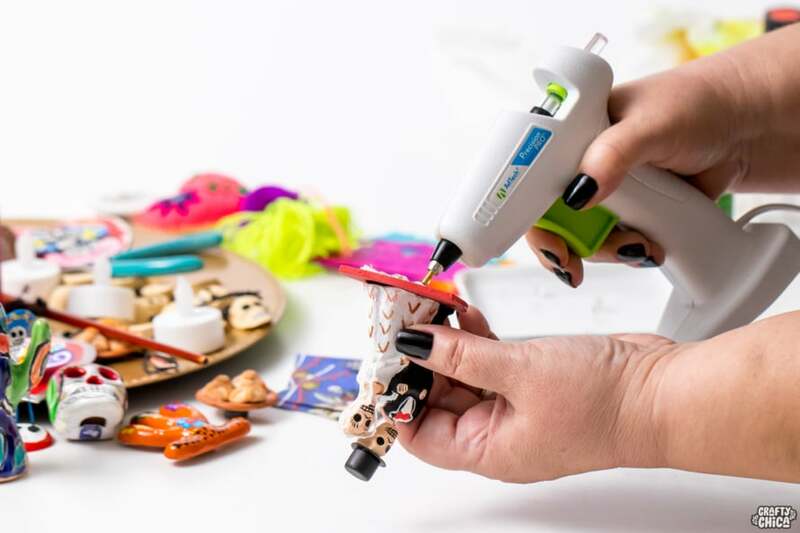 Next Article10 Super cool torch crafts! Oh my goodness. 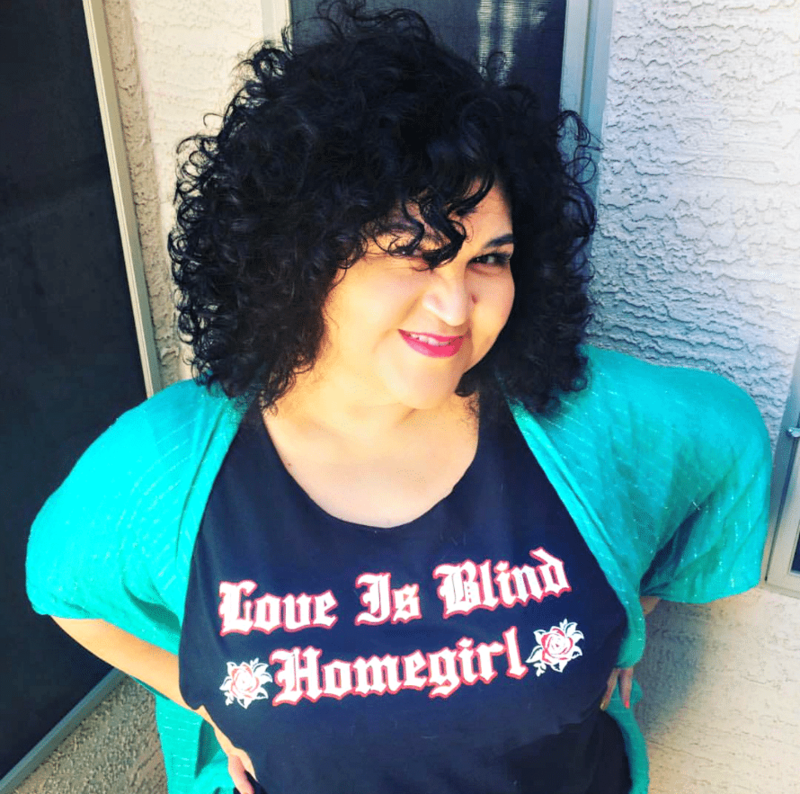 Have fun meeting her. 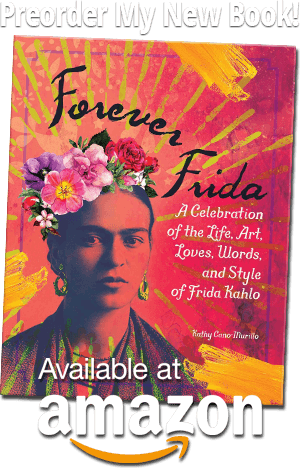 Your new book looks wonderful! I’ve already ordered a copy!